Imagine a zinc sunscreen that really looks to stay on and protects the skin for up to 4 hours. The tinted Sticky Zinc sunscreen by 'we are feel good inc.' is the ultimate protection for everyday. It works by going on just like a BB cream whilst your skin stays protected and feels so nourished all thanks to Aloe Vera and Vitamin C.
Sticky Zinc is perfect for those who tend to stick outdoors such as playing sports or even hanging out at the beach. The Sticky Zinc sunscreen feels super soft on the skin and looks to protect the skin for up to 4 hours before needing to re-apply once again. I find it so easy and helpful to use especially when I know that I'll be outdoors for long periods. (Essentially, it provides a high broad spectrum of SPF 50+ which ideal for my lifestyle.) Of course when it comes to protecting your skin from the harsh UVA and UVB rays, make sure to wear a hat and avoid the sun during the harshest times of the day. 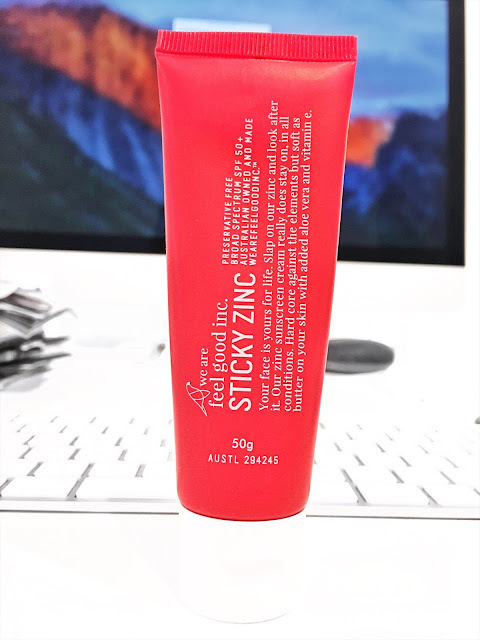 Sticky Zinc RRP $29.95 and can be found at their official website here. Have you tried Sticky Zinc before?